Gulang Islet covers an area of 1.87 square kilometers. 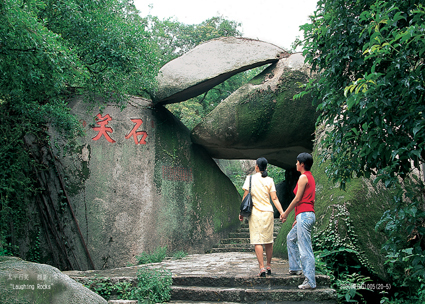 Sunlight Rock, the highest peak on the islet, is the symbol of Xiamen. Because the holes in the southwestern reefs hit by the waves will make sounds like beating the drum, it got its name Gulang Islet, meaning “drum waves”. On the islet, tourists can find winding coastal lines, natural and gentle seaside bathing grounds with fine sands, and oddly shaped reefs showing superlative craftsmanship, which will make every visitor think a lot, The undulating hills, blue waves, white clouds, green trees and red tiles add beauty and radiance to each other, offering a clean, tidy and tranquil environment. The residents on the islet love music very much. With a small population of over 10,000, Xiamen has over 600 pianos, ranking first in China in the density of pianos. Hence it is called the “ Island of Pianos” and the “ Land of Music.” Walking on the street, visitors can hear the melody of piano everywhere. The winding and zigzag paths are another major characteristic of Gulang Islet. All the paths on the islet are linked with each other, with the delightful serenity of seclusion. To protect tourism resources on the islet, motor-driven vehicles are forbidden to run on the streets, except for a small number of sightseeing storage battery cars for carrying tourists. Therefore the islet is quiet without the noise of traffic, making tourists have fun to stroll on the streets. At nightfall, when all neon lamps are lit, the whole islet is elegantly decorated, presenting beautiful scenes different from those in the daytime. When viewing Xiamen at night across to Egret River between Gulang Islet and Xiamen Island, tourists will see colorful lamplights and water surface set each other off beautifully along the long coastal line. Tourists may get on a ferryboat at the wharf to go to Gulang Islet.Ferryboat:07:00-19:00,once every 10 minutes; and once every 15 minutes for the other periods of time. 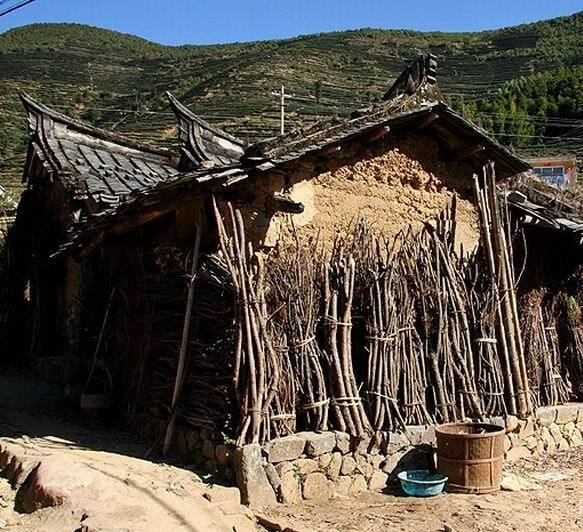 A round-trip ticket costs eight yuan; and charged on the back way. Tourists can go to the ferry by public bus Nos2,3,4,8,10,11,12,14,23,25,27,28,30,31,32,44,50,66,67 and 85. Gulang Islet has many shell shops and dried fruit stores. On Longtou Road, tourists can buy meat pies, a special product of Gulang Islet. Musicians on the islet hold the certificates issued by the government. They are all good at playing musical instruments. Listening to their performance is a wonderful enjoyment indeed. Situated at the top of Dragon Head Hill in the central by south of Gulang Islet, Sunlight Rock consists of two huge rocks, one horizontal; and the other vertical. The two rocks leaning on with each other, with an elevation of 92.68 meters, form the highest spot of Gulang Island. A huge rock is piercing into the sky. The lofty and rugged rocks in the mountains form many caverns and gullies, while pavilions, kiosks and terraces are tucked away in the lushly growing woods. The ruins of the drilling terrace on water. Standing at Sunlight Rock, tourists can have a panoramic view of Xiamen, Gulang Islet, Dadan Islet, Erdan Islet and other places of scenic and historic interest. Tips: The observation terrace at the top of Sunlight Rock is small in size, and is always crowded with tourists in the daytime. If it is possible, tourists are suggested going there at dusk when Sunlight Rock has fewer tourists. Lying at the northern foot of Sunlight Rock, the Zheng Chenggong Memorial Hall was built on February 1,1962 to commemorate the 300th anniversary of the recovery of Taiwan by Zheng Chenggong. The memorial hall covers an area of 13,000 square meters, and the main exhibition hall has an area of 2,200 square meters. The site of the memorial hall was the place where Zheng Chenggong stationed his troops and commanded the drilling of the waterborne forces. Now tourists can still find many historical sites, such as the soldier-drilling terrace on water and the village gate, as well as a great number of inscriptions by famous personages. ”Taiwan, a Treasure Island of China,” Crossing the Sea for an Eastern Expedition, and Driving out the Dutch to Recover Taiwan,” Overcoming Difficulties and Hardships to Develop Taiwan, “His Great Constributions Shining Through the Ages,” and “Inspiring the Later Generations with His National Spirits.” Over 800 varieties of exhibits ae on display, such as historical relics, documents,written materials, photos,charts, paintings ,sculptures and models, introducing the glorious life of Zheng Chenggong in a systematic way. Situated in Hero Hill southwest of Sunlight Rock, the Piano Garden was constructed in 1993, and is a scenic area full of musical and cultural charm. The Piano Garden consists of a number of tourist attractions, all of which lie on the hillside, such as the Rhythm Square, Piano Thinking Square, Pleasant Musical Sound Tower, Flowing Music Pavilion, Remaining Leisure Gate, Listening to Wave Cliff, and so on. Each of them is linked with pianos, reflecting the characteristic of Gulang Islet as the “Islet of Pianos.” In addition, the Piano Garden also includes the Aviary Garden, a cinema and the Hero Garden for people to cherish the memory of martyrs. Located in the dense forest on the western slope of Hero Hill, the Aviary Garden covers an area of 7,000 square meters, and is home to nearly 1,000 birds, which fall into 100 varieties. As a large bird observation zone, the garden consists of artificial hills, streams, waterfalls and small paths. 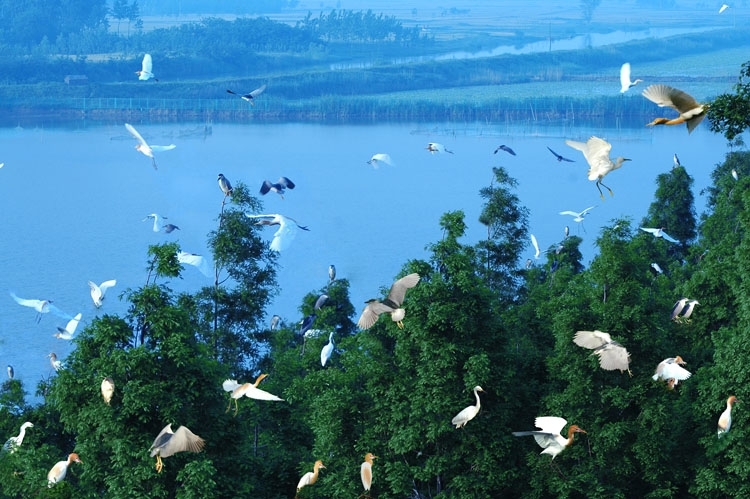 According to the ecological types of birds, a number of small gardens were built, such as Rare Birds Village, Birds Pond, Birds Forests, Peacock Terrace, Pheasant Land and Flower Stand, and Performance Garden, forming a scenic spot of gardens in garden. Tips: The performance of birds starts at 10:30 every morning, and lasts about 40 minutes, with a total of over 20 items. 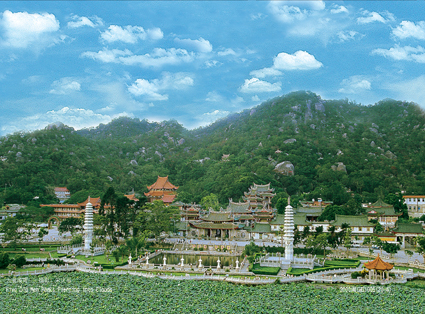 Gulang Islet gathers together over 1,000 architectural structures, showing different styles and a good combination of Chinese and Western elements. 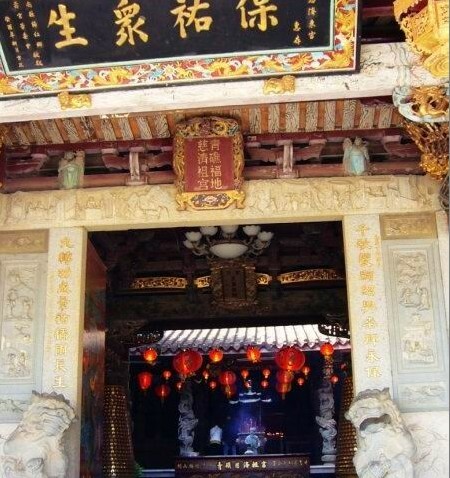 They include traditional Chinese temples with upturned eaves and corners, one-story houses in the style of South Fujian Province, the Eight-Trigram Building (which is now Xiamen Museum), showing both the Chinese and foreign architectural characteristics, small and exquisite Japanese houses, former consulates of Western countries with continental style of 19th century. Shuzhuang Garden with the features of the classical gardens in South China, and so on. With a great number of buildings of defferent periods in various styles, Gulang Islet is an encyclopedia of architecture indeed. After going through ups and downs in the past century, these buildings still stand on the paths, or are tucked away in colorful flowers and green trees, creating the thick and profound cultural connotations of Gulang Islet, and becoming a special scenic attraction. These buildings are of high artistic and research value. 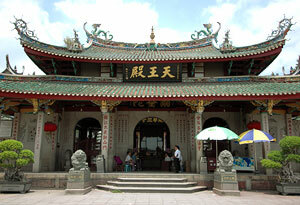 It is a private villa first constructed in 1913 by Lin Erjia, a wealthy businessman from Taiwan. 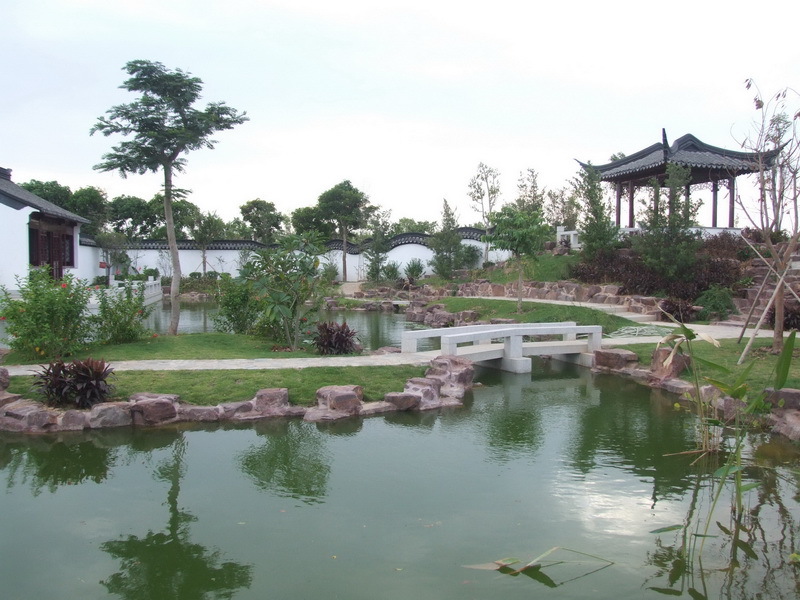 Shuzhuang Garden is known for its well-conceived layout and borrowed scenes. The designer cleverly adopted the hiding, borrowing and ingenious methods to design the garden, making man-made structures and natural scenery well blended in good harmony, and enabling visitors to enjoy different scenes when moving a step forward. The garden faces the sea and backs on to Sunlight Rock, including hills ,the sea, bridges, forests and flowers. The garden is divided into two parts— Garden Hiding the Sea, and Garden Making-Up Hills. The sea is hidden from view in the garden, and the garden is expanded by the sea. The hill is made up by rocks, and the sky is hidden in caves. When entering the garden, tourists will not see the ocean as their view is blocked by a wall screen. 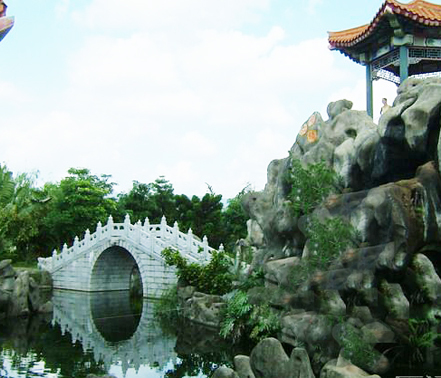 Shuzhuang Garden contains 44 meandering bridges. Walking on the bridges, tourists will feel as if they stepped on waves. The artificial hill with 12 caves has some zigzag going-through tunnels, spiraling up and down. All the scenic spots in the garden complement with each other in picturesque disorder, and form an integral whole. The exquisite and refined courtyards form a sharp contrast with roaring waves and flying seagulls, each shining more brilliantly in the other’s company. Tourists will be surely attracted by the garden’s fascinating scenery. Located in the Hall of Roaring Tides in Shuzhuang Garden, the Piano Museum covers an area of nearly 1,000 square meters. It is the only museum in China displaying various kinds of antique pianos from defferent countries in the world. All the pianos in the museum were donated by Hu Youji, a collector of pianos who is a native of Gulang Islet and now resides in Australia, including nearly 100 precious pianos and over 60 ancient piano lamps collected by Mr.Hu in his life. In the Piano Museum, tourists can find the “steinway” piano of the United States and the “Bosendorfer” piano of Austria, both produced in the first half of the 19th century, the precious gilded piano,. the oldest square piano, the largest upright piano, and the oldest hand-operated piano. In particular, in the center of the big hall there are two pianos, which have the patterns of flowers and birds with Chinese classical flavor meticulously and beautifully pieced together with wood. Musicians play piano once every half an hour in the museum. While enjoying the melodious piano music in the kingdom of pianos, tourists will be immersed in the musical atmosphere of the Music Islet. Tips: Photos-taking is prohibited in the Piano Museum. As the Piano Museum is located in Shuzhuang Garden, no admission ticket is required. 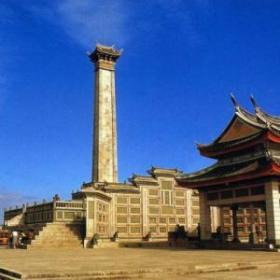 It is a theme park to commemorate Zheng Chenggong, a national hero. Located on the southeastern seashore of Gulang Islet, the Bright Moon Park covers an area of 30,000 square meters. First constructed in 1985, the park was named because of a poem which aiming to cherish the memory of the hero and Taiwan. The most attractive in the park is a huge granite statue of Zheng Chenggong on a huge rock. The statue is 15.7 meters high, 1,617 tons in weight, and is formed by 625 pieces of “Quanzhou white” granites, with 23 layers in total. Fuding Rock, 29.5 meters above sea level, stretches 30 meters to the sea, and stands on three legs like a tripod with Sword Rock and Yindou Rock in the sea. The statue of Zheng Chenggong stand on the three rocks in martial attire looks over the sea, as if he was commanding an army, full of power and grandeur. In the square of the park stands a large relief screen of a group of people, named “Driving out Invaders with Shields,” which represents the historic scene that Zheng Chenggong led his troops to cross the sea, drive away the Dutch and recover Taiwan. It is the largest relief with historical figures in China today. The Bright Moon Park consists of the buildings with the architectral features of the Ming Dynasty, seagulls, green trees, the vast sea and radiance to each other and present a beautiful picture. Located on Fuxing Road in the southeast of Gulang Islet, the Yuyuan Garden was constructed to commemorate Lin Qiaozhi(1901-1983), a famous doctor of gynecology and obstetrics in China. With an area of 5,700 square meters, the garden has a natural and harmonious layout. A white marble stone statue of Doctor Lin sits on a stone open space in the Yuyuan Garden. With a kindly face and in simple and plain clothes, the statue looks as affable as a kind mother. The “Exhibition Hall of Dr.Lin Qiaozhi’s Life” holds over 100 photos on Dr.Lin’s life and work, and many objects she once used. Comrade Deng Yingchao(1902-1992), a famous proletarian revolutionist, statesman and one of the leaders of Chinese women’s movement, planted two araucarias in the garden in person, symbolizing Dr.Lin’s lofty trait characters. Dr.Lin was born into a teacher’s family on Gulang Islet. She graduated from the Peking Union Medical College in 1929. In her life, she served as midwife for over 50,000 infants and treated numerous patients with gynecological diiseases, dedicating all her life to work. The Yuyuan Garden is a place to express the local people’s respects to Dr.Lin. Around Gulang Islet there are many natural bathing grounds. With gentle slopes and fine sands, these bathing grounds are suitable for leisure and swimming. Visitors will be pleased to enjoy themselves on the bathing ground while appreciating the picturesque scenery, viewing the undulating waves, and listening to the melodious piano music from a distance. Gulang Islet embraces a number of seaside bathing grounds, such as Gangzaihou, Dadeji and Meihua seaside bathing grounds, as well as the bathing grounds in the Bright Moon Garden and the Viewing Sea Garden, of which Gangzaihou Seaside Bathing Ground is the most famous one. 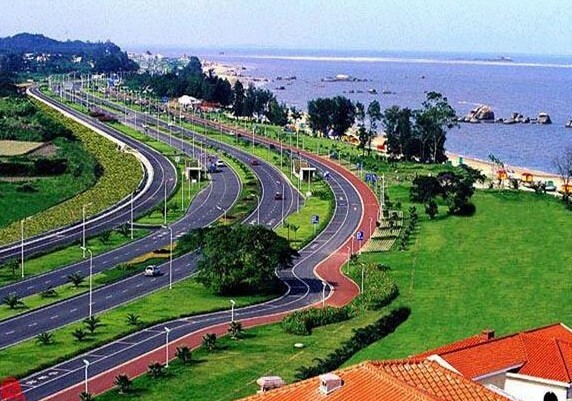 The Gangzaihou Seaside Bathing Ground is situated west of the Shuzhuang Garden. The sea surface in Gangzaihou is also called the golden belt water. With fine and soft sands, gentle slopes, peaceful waves and a slow flow rate of water. Gangzaihou Seaside Bathing Ground has no sharks. The temperature of the water here is above 20? for five and a half months a year, and it is suitable for swimming for six hours a day in six months a year. 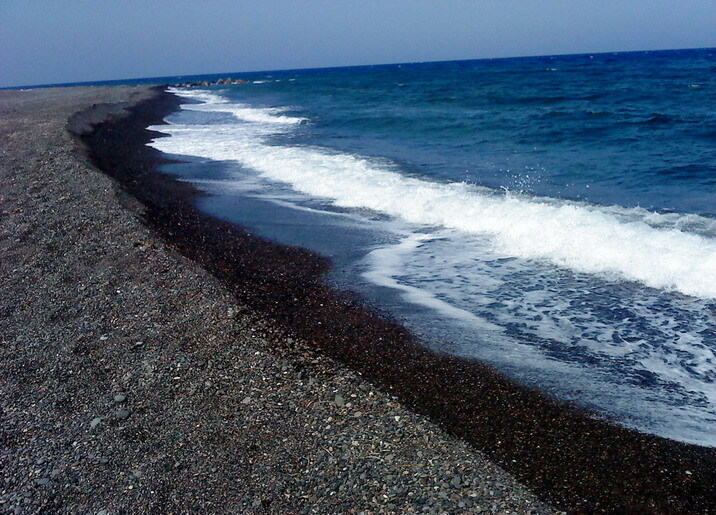 With fascinating scenery, fine sands and high-quality water, it is an ideal natural seaside bathing grounds. The bathing ground offers various kinds of service facilities, as well as yachts and motorboats. In 1998, the National Op-Class Sailing Boats Championship was held here. . Located in the original Gulang Park west of the Gulangyu Ferry Wharf, the Xiamen Underwater World is one of the largest aquariums with the most characteristics in China, setting two world’s records and 10 national records. The Xiamen Underwater World, looks like a Crystal Palace in blue color. It covers an area of 175,000 square meters, and its floorage area totals 7,500 square meters. The Crystal Palace is home to over 10,000 rare aquatic animals from all over the world, which fall into over 350 species, such as sea otters and rays of Australia, river sturgeons from the Mississippi of the United States, penguins of Peru, Julongfish from the Amazon, Chinese sturgeons from the Yangtze River, rock fish and sea horses from the South China Sea, octopuses from the East China Sea, and various kinds of coral reef fish, which will make visitors gasp in admiration. The Ocean World also includes the Sea Hall, Specimen Hall of Sperm Whales, Penguin Hall, Fresh Water Fish Hall, and Dolphin and Sea Lion Performance Hall. Walking along the submarine tunnel, 80 meters long and 1.5 meters wide, tourists can take a tour of the wonderful and mysterious seabed world together with numerous fish, and go close to see how fish catches fish. Located at 111 Lujiao Road on Gulang Islet, the Hall of World Celebrities integrates history, culture, recreation and multi media art, with an area of 1,500 square meters. The hall contains over 100 vivid and full-length silica gel statues of world-renowed movie stars, sports star and politicians through the super realistic sculpting expression way. All the statues are in life size, with the exactly same color and sense of quality as the real human beings. The sculpture “Tempest to the Ancient City” vividly displays the touching scene of recovering Taiwan by Zheng Chenggong. The hall includes the science fiction theater with equipment imported from New Zealand. Through the scenery box synthesized by new and high technologies, tourists can see full-length girls from Ali Mountain in Taiwan singing and dancing, just like performances by real dancers. In addition, tourists can also watch Daming Mansion of the Zhangzhou glove puppet opera, which won an international gold medal. When puppets swallow and blow out smoke, wave silk and rods, hold plates and jars, play the lion dance on the stage, audiences cannot help bursting their sides with laughter. Tips: The glove puppet opera is performed once an hour, and the last performance begins at 16:45.